SAITAMA, Japan -- May 8, 2018 -- Beda Bolzenius took up the posts of Calsonic Kansei Corporation's president and CEO on April 1, 2018. 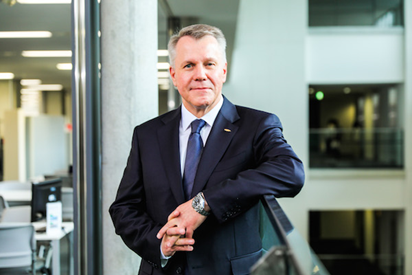 Bolzenius, who became Calsonic Kansei's new leader after receiving the baton from current chairman Hiroshi Moriya who had served as CEO since 2013, talked about his future strategy and vision for the company as new CEO. I was born and grew up in Germany, but I consider myself a global citizen. I have more than 30 years of experience in the world's automotive industry and I am excited to continue this career now with Calsonic Kansei. I am deeply honored to have been appointed such a big role as CEO, and at the same time I feel a heavy responsibility. To fulfill the responsibility, I intend to develop our business by making use of my own experience, personal connections spreading throughout the world and technological expertise on future developments. I am proud to be able to pull the company toward a wonderful future as head of the team. Calsonic Kansei already has a lineup of world-class products. It is important to determine in what fields we want to compete based on the product lineup. Currently, the automotive industry is going through a crucial period of change. There are a broad range of fields which Calsonic Kansei should enter using new technologies such as autonomous driving, electrification, connected cars and car sharing. To do this, we need to think about new products that can be used for various applications. In all fields where we are providing world-class products, new technologies, new generations and new values...I would like to concentrate on what we can provide to this industry. What Calsonic Kansei has achieved over the last 10 years has certainly been based on our great people whose culture and know-how were brought into the growth of the company. I would like to set out to make Calsonic Kansei a truly global company by hiring people who will help us to build a diversified team that can really act on a global scale while leveraging our strength of excellent employees who have deep knowledge of the automotive business. I know Japan from many trips. So I know it's a great, beautiful country. I'm really looking forward to getting a little bit more insights into the culture, meeting a lot of people and admiring the nature of this country. I'll be pretty busy with my business, but I'm really looking forward to enjoying the part of the new adventure as well.